Until this weekend Las Vegas (Nv.) 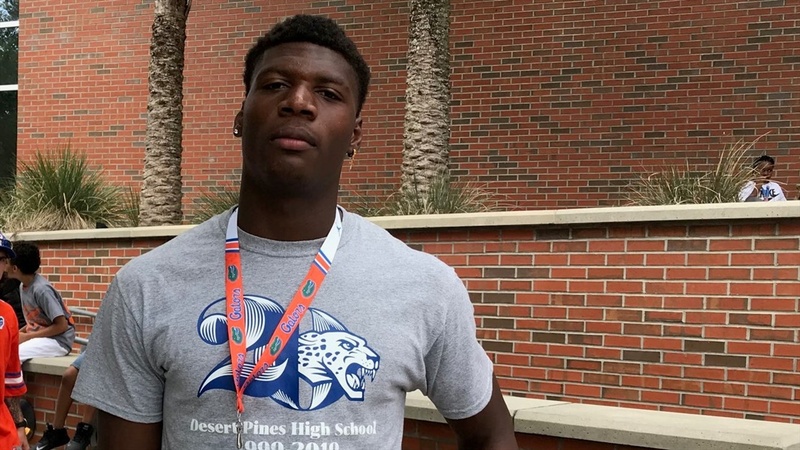 Desert Pines five-star tight end Darnell Washington‍, the No. 18 prospect in the nation according to the 247 Composite, hadn't had a chance to visit Florida, one of the many programs he currently has under consideration, so he decided to spend his spring break touring several college campuses. What the 6-foot-7, 250-pounder saw on Saturday was an offensive showcase as the Orange defeated the Blue 60-35 as the two teams - facing base defenses - combined for 762 yards passing. Included in that total was tight end Kemore Gamble catching two passes for 65-yards while a second tight end - Kyle Pitts - was moved around, lining up in several places and contributing another 56 yards through the air. Washington will visit both Miami and Alabama before returning home out west. He wants to go to LSU, Texas and Texas A&M on his next set of visits. As for a timeline he said that he plans on taking his official visits before the Under Armour Bowl in January.